Serious inquirers may send an email requesting direct communications with the seller. Although the paintings are being considered by auction houses, until they are consigned contractually, they will remain available for the consideration of private collectors. Nicholas A. Volpe was a gifted and internationally celebrated artist in his lifetime, and even more so since his passing. Some of his most memorable works include portraits of Hollywood celebrities, and he attained a lifetime contract to create portraits of the annual winners for Best Performance of an Actor and Best Performance of an Actress at the Academy Awards. Among his accolades, Nicholas Volpe was awarded the record industry's Golden Grammy Award for the cover design of Frank Sinatra's Capitol album, "Only the Lonely". 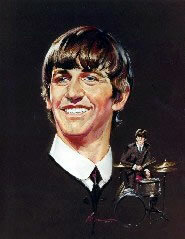 The Beatles first sat for Nicholas Volpe in 1964 at New York's Waldorf Astoria. 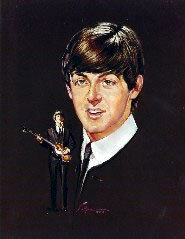 These portraits were not finished at the first sitting, and Volpe's next session with the Beatles took place in Las Vegas after their historic appearance on the Ed Sullivan Show. It was after the Las Vegas sitting that the paintings were completed by the artist. 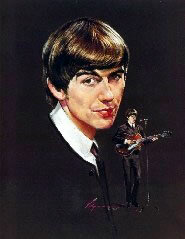 Capitol Records published these paintings in the form of posters which were included in one of the first Beatles albums ever produced. Nicholas Volpe autographed this photograph of himself with his paintings for the current owner of the foursome. 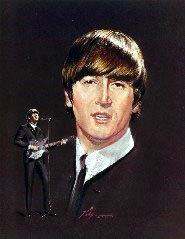 The current owner of the paintings resides in southern California, and has a plaque that reads: "These original paintings of the Beatles are the work of Nicholas Volpe, world renowned artist, who was commissioned to paint such great personalities as John F. Kennedy, Ronald Reagan and Frank Sinatra." On the morning of December 8, 1980, the day that John Lennon would be assassinated by Mark David Chapman, the painting of John Lennon inexplicably fell from the wall and landed on the floor. The artist himself, Nicholas Volpe, repaired the painting soon afterward. Son of an Italian immigrant family, Nicholas Volpe was born in the New England community of New Haven, Connecticut. Because he showed an exceptional talent with the violin, his parents sent him to studyin Italy. Homesick for America, he soon returned to continue his formal education. Mr. Volpe entered New York's Syracuse University on a football scholarship. There his talent as an artist began to blossom. Rather than accept a Syracuse professorship upon graduation, he considered he had much more to learn. He entered and won the coveted Tiffany Foundation Art Scholarship Award for which thousands compete and only six are victorious. As part of the award, Mr. Volpe moved to the famed silversmith's baronial estate on Long Island to pursue his artwork in seclusion among the varied resplendent land and seascapes. Flourishing in all media of his work, Mr. Volpe eventually became an instructor of fine arts at New York City's Leonardo Da Vinci Art School where he transported his ideas and conceptions of depth and creative interpretation to enthusiastic students there. Two years later Mr. Volpe accepted the post of Dean of Arts at Jacksonville College in Florida. This lasted three years until he migrated to Hollywood where he had been commissioned to design sets, create makeup and fashion costumes for many motion pictures. But it was Nicholas Volpe's powerful portraits of that industry's leading personalities which formed an unassailable reputation for this dedicated artist. Among many others, he painted Clark Gable, Tyrone Power, Bette Davis, Spencer Tracy, Katharine Hepburn, Frederic March, Bing Crosby, Jennifer Jones. When Mr. Volpe received a lifetime contract by the Academy of Motion Pictures Arts and Sciences to execute portraits each year of the actor and actress awarded that institution's Academy Award ("Oscar"), he made southern California his home where he would raise three children. Mr. Volpe was awarded the record industry's Golden Grammy Award for the cover he designed for the Frank Sinatra album, "Only the Lonely". This led to a commission from the Hollywood Brown Derby to paint nearly 200 of the nation's top recording artists for its Hall of Fame Record Room. As a former athlete himself, Mr. Volpe possesses the gift to capture, on canvas, the physical drive frozen in action of a myriad of the world's leading sports figures. 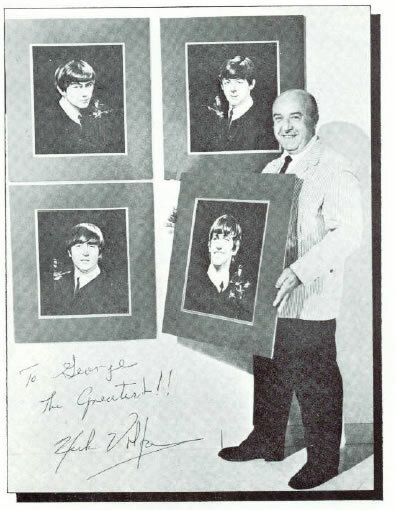 In conjunction with his sports figures' portraits, Mr. Volpe conducted numerous cross-country tours of television, radio and live personal appearances. A poet and author of note, Mr. Volpe was well know for his "Byways", a Hearst syndicated newspaper feature series, where he sketched and wrote about places of interest in the State of California. During his distinguished career, Mr. Volpe completed portrait commissions of the late President John F. Kennedy, British Prime Minister Winston Churchill, General Dwight D. Eisenhower, President Ronald Reagan, and traveled to Israel to create a historic oil portrait of the Israeli Premier of that time, David Ben Gurion. Nicholas Volpe passed away in 1992. This booklet contains more information about Nicholas Volpe and shows many of his other works.